In this paper, the robust control problem of delayed fin stabilizer stochastic system of a ship with uncertainty is discussed and investigated. To describe the system, Linear Parameter Varying (LPV) modelling approach and multiplicative noise term are used to establish the corresponding polynomial model. For simulating the general operating environment, the delay effect is considered as time-varying case. Moreover, the gain-scheduled control scheme is employed to discuss the delay-dependent stabilization problem and to design the corresponding controller. Moreover, a novel Lyapunov-Kravoskii function is proposed by using parameter-dependent matrix and integral Lyapunov function to reduce the conservatism of the derived stability conditions. In order to apply the convex optimization algorithm, the derived conditions are converted into Linear Matrix Inequality (LMI) form. 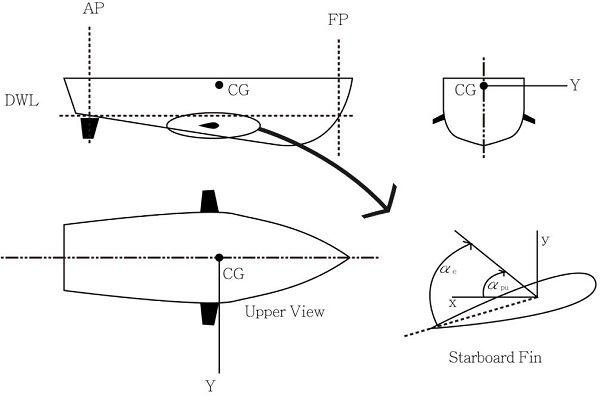 By solving the conditions, some feasible solutions can be obtained to establish the controller to guarantee robust stability of the delayed fin stabilizer stochastic system of a ship in the mean square. H. Jin, Y. Luo, and Z. Wang, “Design of sliding mode variable structure controller for electric servo system of fin stabilizer,” Proc. of the Sixth World Congress on Intelligent Control and Automation, vol. 1, 2006, pp. 2086-2090. Y. H. Liang, H. Z. Jin, and L. H. Liang, “Fuzzy-PID controlled lift feedback fin stabilizer,” Journal of Marine Science and Application, vol. 7, no. 2, pp. 127-134, June 2008. T. Perez and G. C. Goodwin, “Constrained predictive control of ship fin stabilizers to prevent dynamic stall,” Control Engineering Practice, vol. 16, no. 4, pp. 482-494, April 2008. C. Y. Tzeng and C. Y. Wu, “On the design and analysis of ship stabilizing fin controller,” Journal of Marine Science and Technology, vol. 8, no. 2, pp. 117-124, January 2000. N. Wang, X. Meng, and Q. Xu, “Fuzzy control system design and stability analysis for ship lift feedback fin stabilizer,” Proc. of 7th World Congress on Intelligent Control and Automation, IEEE Press, August 2008, pp. 1223-1228. Z. H. Xiu and G. Ren, “Fuzzy controller design and stability analysis for ship's lift-feedback-fin stabilizer,” Proc. of the 2003 IEEE International Conf. Intelligent Transportation Systems, IEEE Press, December 2003, pp. 1692-1697. F. Blanchini, D. Casagrande, S. Miani, and U. Viaro, “Stable LPV realization of parametric transfer functions and its application to gain-scheduling control design,” IEEE Transactions on Automatic Control, vol. 55, no. 10, pp. 2271-2281, October 2010. L. Liu, X. Wei, and X. Liu, “LPV control for the air path system of diesel engines,” IEEE International Conf. Control and Automation, November 2007, pp. 873-878. J. Daafouz, J. Bernussou, and J. C. Geromel, “On inexact LPV control design of continuous-time polytopic systems,” IEEE Transactions on Automatic Control, vol. 53, no. 7, pp. 1674-1678, August 2008. F. Wu and K. M. Grigoriadis, “LPV systems with parameter-varying time delays: analysis and control,” Automatica, vol. 37, no. 2, pp. 221-229, February 2001. M. G. Yoon, V. A. Ugrinovskii, and M. Pszczel, “Gain-Scheduling of minimax optimal state-feedback controllers for uncertain LPV systems,” IEEE Transactions on Automatic Control, vol. 52, no. 2, pp. 311-317, February 2007. X. L. Zhu and G. H. Yang, “Jensen integral inequality approach to stability analysis of continuous-time systems with time-varying delay,” IET Control Theory and Applications, vol. 2, pp. 524-534, 2008. B. Chen, X. Liu, and S. Tong, “New delay-dependent stabilization conditions of T-S fuzzy systems with constant delay,” Fuzzy Sets and Systems, vol. 158, no. 20, pp. 2209-2224, October 2007. W. J. Chang, C. C. Ku, and P. H. Huang, “Robust fuzzy control for uncertain stochastic time-delay Takagi-Sugeno fuzzy models for achieving passivity,” Fuzzy Sets and Systems, vol. 161, no. 15, pp. 2012-2032, August 2010. L. E. Ghaoui, “State-Feedback control of systems with multiplicative noise via linear matrix inequalities,” Systems & Control Letters, vol. 24, no. 3, pp. 223-228, February 1995. S. Boyd, L. E. Ghaoui, E. Feron, and V. Balakrishnan, Linear Matrix Inequalities in System and Control Theory, Philadelphia: SIAM, PA, 1994. W. J. Chang, Y. C. Chang, and C. C. Ku, “Passive fuzzy control via fuzzy integral Lyapunov function for nonlinear ship drum-boiler systems,” ASME, Journal of Dynamic Systems, Measurement and Control, vol. 137, no. 4, pp. 041008-1-041008-10, April 2015. Submission of a manuscript implies: that the work described has not been published before that it is not under consideration for publication elsewhere; that if and when the manuscript is accepted for publication. Authors can retain copyright in their article with no restrictions. Also, author can post the final, peer-reviewed manuscript version (postprint) to any repository or website. From Oct. 01, 2015, PETI will publish new articles with Creative Commons Attribution Non-Commercial License, under Creative Commons Attribution 4.0 International Public License.